Social media automation is often referred to as a negative thing. The primary point of social media is to actively engage with people. How can automation help if it takes people out of the equation? The answer is simple: When automation frees up more time for personal engagement, it leads to social media success. The key is to automate the right tasks. Here are some automation tasks and tools so you can spend less time focusing on the mundane and more time taking care of the to-dos that get results. There are two sources of content you can share with your social media audience: content you create (such as blog posts) and content you curate from other industry leaders who are not competitors. By sharing both types of content, you position yourself as a business that not only stays up-to-date with the latest news and trends, but also helps their audience and customers do the same. Creating and finding great content to share can be time-consuming. Fortunately, there are tools that can help you automate both efforts. First, you want to automate the sharing of content you create. The easiest way to do this is with Buffer. In Buffer, you create a daily schedule of the best times to share content. For example, if you wanted to target an audience in a certain city during normal business hours, you could create a schedule that sends updates between 8 a.m. and 5 p.m. 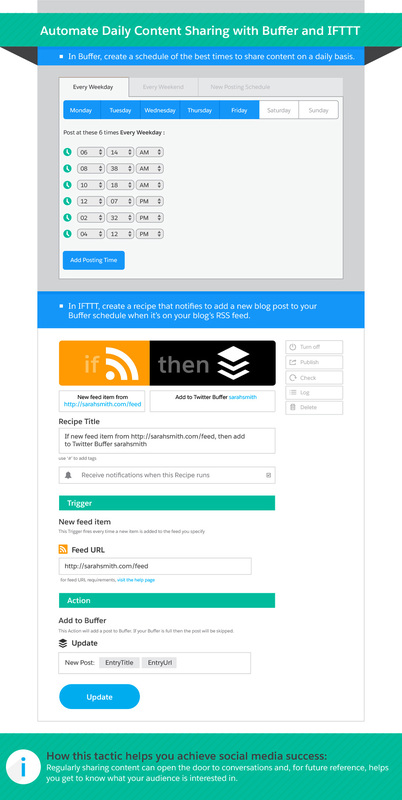 In IFTTT, you create a recipe (a simple connection between products and apps) that reminds you to add a new blog post to your Buffer schedule when it’s on your blog's RSS feed. This recipe automates sharing content from your blog to your social audience at appropriate times through Buffer. 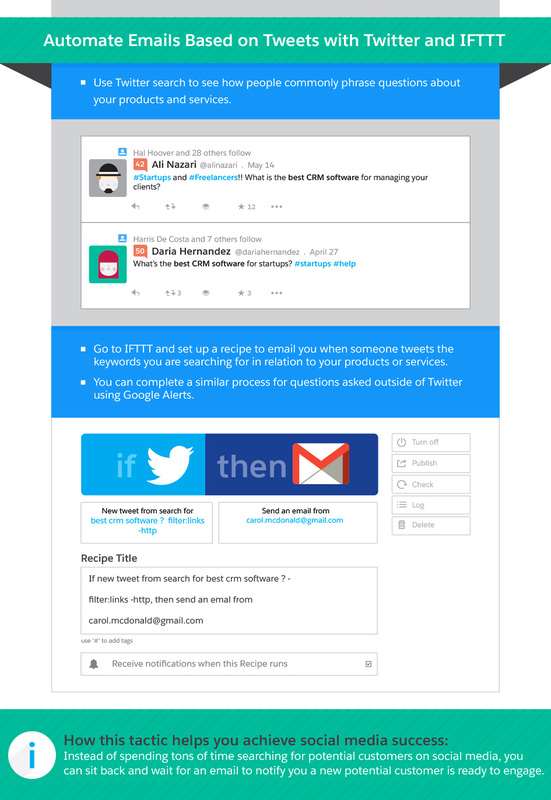 If you don't use Buffer, you can use IFTTT recipes to share directly to your social media accounts (Twitter, Facebook pages, Facebook groups, etc.) as soon as the post goes live. Just publish your posts at an ideal social sharing time, and you'll be set. Second, you want to automate the sharing of content you curate. You don't want to automatically share all of the content published from any one source since you never know what others will publish. You can shoot for 100 per cent automation using the same IFTTT recipe mentioned above using another blog's RSS feed. 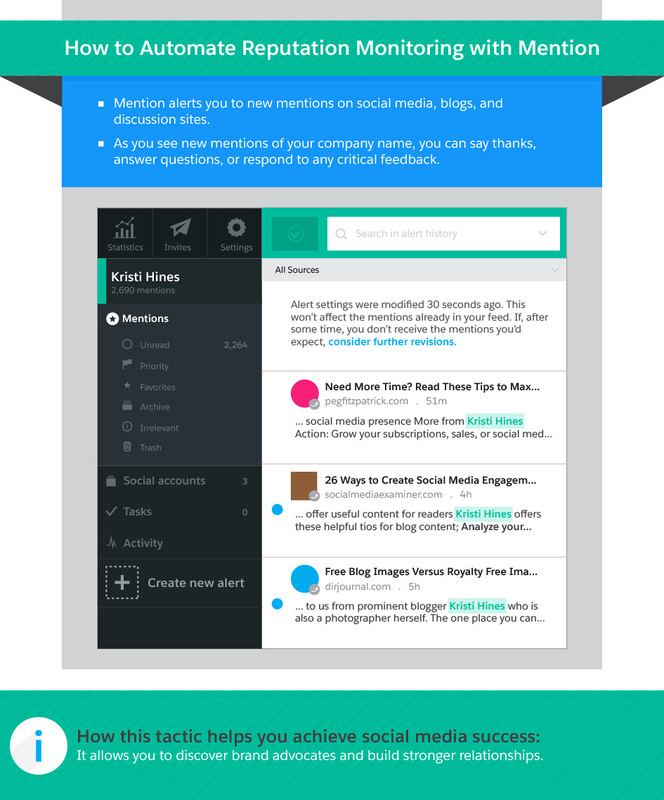 You can also go for a 50-50 approach that involves you choosing the content to share from other blogs. Start by subscribing to your favorite industry news sources using Feedly. In IFTTT, you create a recipe that says any posts you save for later in Feedly would be added to Buffer. With this recipe in place, all you need to do is save a post you think your social media audience would like in your Feedly subscriptions for later. The IFTTT recipe adds it to your Buffer. If you don't use Buffer, you can use IFTTT recipes to share posts directly to your social media accounts (Twitter, Facebook pages, Facebook groups, etc.) that you save in Feedly for later. The downside is if you save a dozen posts in Feedly for later within a short period of time, you'll share a dozen posts in a short span to your social accounts. For this reason, using the Buffer schedule to spread your updates is a better approach. How do these tactics help you achieve social media success? People will often thank you for sharing great content that’s published by you and others. Regularly sharing content can open the door to conversation and helps you get to know what your audience is interested in for future reference. Chances are you don't have time to search for ideal customers on social media every day. Fortunately, there are easy ways to automate that process so you spend less time searching and more time interacting. Twitter lists allow you to follow a large group of people (up to 500) in thematic lists. SocialBro has a rule-builder feature that adds people to Twitter lists automatically when they follow you, retweet you, mention you, favorite your tweets, or add you to one of their lists. You can filter these people by specific criteria, such as keywords in their bio, location, time zone, gender, and other demographics. You can now have a Twitter list full of people who could become your ideal customers. In addition, you can automate an email notification to let you know someone has been added to your ideal customer list. Most people frown upon automated direct messaging or ignore their direct messages altogether, so it may be best to skip this option from any service. The only exception is if you target highly specific people outside of the marketing industry. For example, if you are a business that helps wedding photographers get new customers, you could send a direct message to wedding photographers that follow you on Twitter. That message could link them to your free e-book on how to obtain more customers for wedding photographers. Lots of people turn to the Internet when they need recommendations. It's your job to be one of the first to respond if your business can suit the person's needs. You can get questions sent to your inbox using the following tools. First, you'll want to start with Twitter search to see how people commonly phrase questions about your products and services. Then, you'll want to go to IFTTT and set up a recipe to email you when someone tweets the keywords you are searching for in relation to your products or services. The “? -filter:links -http” portion of the Twitter search helps filter out tweets from people who share content that answers a question versus people who are asking a question. Bonus Tip: You can complete a similar process for questions asked outside of Twitter using Google Alerts. Start by performing a few searches on Google for keywords your potential customers may use when asking questions. Note the websites on which questions appear most and create an alert. Instead of spending tons of time searching for potential customers on social media, you can sit back and wait for an email to notify you a new potential customer is ready to engage. Knowing who is talking about you as soon as possible can help you build a positive reputation. Reputation monitoring using tools like Mention alerts you to new mentions on social media, blogs, and discussion sites (forums, blog comments, etc.). As you see new mentions of your company name, you can say thanks, answer questions, or respond to any critical feedback. You can stay informed on what people think of your business. How does this tactic help you achieve social media success? You will likely discover a lot of brand advocates along the way. Reward them with an acknowledgment— a simple thank you, a small gift, or similar. You will connect with your biggest fans and build stronger relationships. They, in turn, will likely continue singing your praises to their social media audiences. If you want to be successful, you need to keep tabs on what your competitors are up to on social media. Use a monitoring tool and create a landscape with your business and your competitors. From here, you review lots of data about your competitors' social media presence and activity. Specifically, you can view summary reports letting you know where you stand, and detailed reports on the specifics. 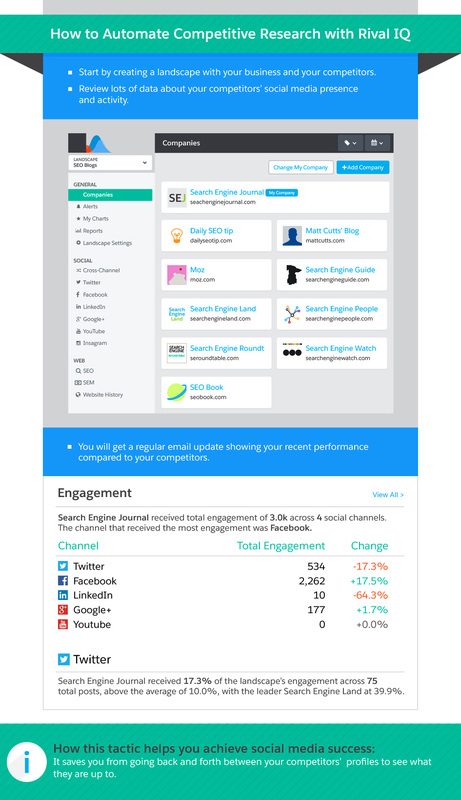 You will also get a regular email update showing your recent performance compared to your competitors. It saves you from having to go back and forth between your competitor's profiles to see what they are up to. Instead of wondering what they are doing right, you can find out through a quick analysis. 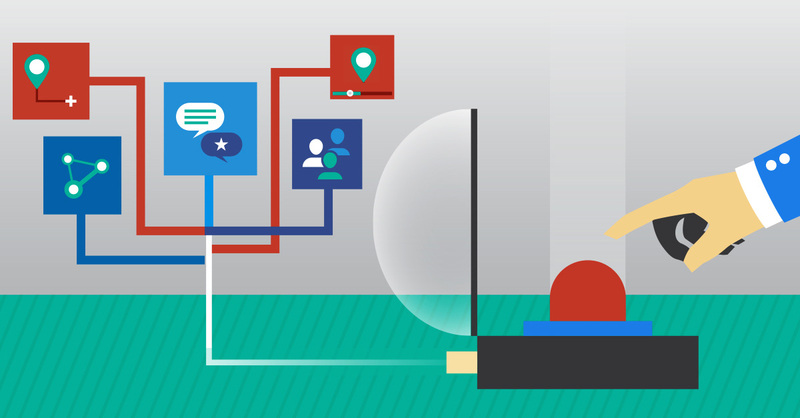 Social media automation doesn’t have to be a bad thing. It's necessary if you want to have more time to focus on engagement and more insights into what works, who to engage with, and where to engage. If you automate the areas mentioned above, you will be well on your way to a more successful social media strategy.